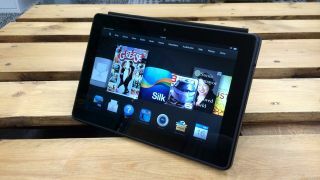 New 8.9-inch Kindle Fire HDX heading this way? It's been a while since Amazon's last Kindle Fire (the Kindle Fire HDX) hit the shelves, so it's no great surprise that we're beginning to hear rumblings of the next iteration. G4Games spotted a benchmark for a new Kindle Fire HDX in AnTuTu's database, but while some things are being improved a lot appears to be staying the same. According to the benchmark the new Kindle will have an 8.9-inch 1600 x 2560 display (for a pixel density of 339 pixels per inch), just like last year's model. It will also have an 8 megapixel main camera, a 1-megapixel front-facing camera and 2GB of RAM, which again is much the same as the current version. The only real changes seem to be the processor and GPU, which are a 2.5GHz quad-core Snapdragon 805 and Adreno 420 respectively, compared to the 2.2GHz quad-core Snapdragon 800 and Adreno 330 in the original Kindle Fire HDX. It's also listed as running Android 4.4.4, which would be a slight boost, though as this is a Kindle Fire device we're talking about, it'll probably be heavily forked and almost unrecognisable as Android. Sadly we don't know when the new Kindle Fire will land, but the last one launched in November, while the Kindle Fire HD arrived in September, so there's a good chance we'll see it sometime in the tail end of the year. It's also unknown whether Amazon will upgrade the Kindle Fire HDX 7, but if it does it's likely to be packing the same amount of power as the new Kindle Fire 8.9. There might be a new Nexus slate on the way too.